Daoud (motorcycle buddy) knows me too well. 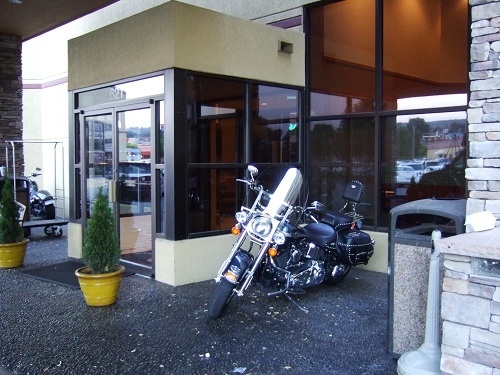 When I had coffee with him last Saturday, he chuckled and noted that I’d already washed the Harley after getting home from my Missoula trip two days earlier. I love shiny things. But I’m ahead of myself. Let’s back up to 12 July. 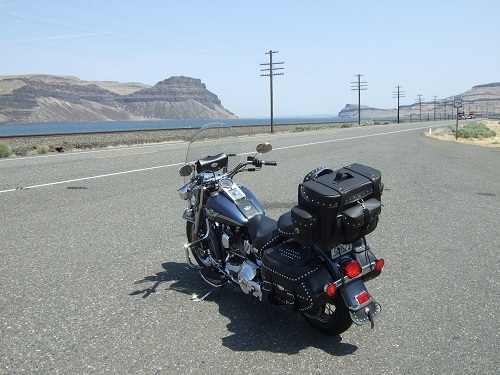 I left Goldendale, WA and headed into the Columbia River gorge. I was backtracking along Lewis & Clark’s final passage on their way to the Pacific in 1804. In the rising heat of my second day on the road, I stopped in Hat Rock State Park for a break. Lewis & Clark described this odd landscape feature, something like a mini Devil’s Tower. The lovely little park is very well maintained, shady, and has interesting signage about L&C and Native Americans of the area. As you roll along the arid expanse of eastern Washington and Oregon, the roads cut through some of the deepest lava flows on earth. Into that basalt, the mighty Columbia has carved a massive gorge that defines a substantial portion of the border between the two states. A stark and fascinating feature of eastern Washington is the Scablands. This unique landscape was formed by the torrent of water released by the drainage (multiple times) of ice-age Lake Missoula. 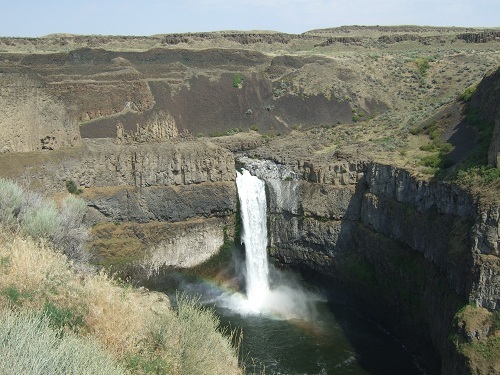 While researching the route for my trip, I stumbled upon a photo of Palouse Falls, which I’d never heard of. I decided to see it, as it cascades over cliffs that are part of the scablands. Out of Walla Walla, I followed Hwy 12 through the pastoral valleys that lead through the small towns of Waitsburg and Dayton. I then turned onto smaller Hwy 261 for 20 miles (32 km) before getting to the cutoff for the falls. This was a two-mile-long gravel road off of what was already a tiny road out in the middle of nowhere. But the park itself was lovely. Very few people were in the park. The Palouse River drops 200 feet (61 m) over the basalt cliffs before continuing towards a confluence with the Snake River downstream. One can easily see that a much larger falls once thundered across here. The heat at the falls was intense but it got hotter as I continued on to my destination for the night. When I reached Clarkston/Lewiston around 5:00 pm, it was over 100 degrees (over 37.7 C) and I was still in leathers. I was also near switching to my reserve gas setting for the second time in the day. But I wanted to try an experiment. I let the gas gauge go all the way to the stops in the red and kept motoring. I wanted to see how far I could go before switching to reserve. I’ve done this by accident before and it’s easy to switch to reserve while moving. I got more than five miles along to a gas station without going to reserve so I still don’t know when it would have started coughing. I put over four gallons in the tank and the capacity is five, so the reserve must be a gallon. That means at 70 mph, I could get 40 miles on reserve. This trip has changed my relationship to the Harley. I’ve crossed a line between keeping him pretty and keeping him busy. Since adding him to my stable in April 2010, I’ve ridden nearly 20,000 miles (32,187 km). And I’m about to add another 1,000 later this week. Although I do love looking at all that shiny chrome and polished gunmetal-grey finish, I’m starting to see him more as a workhorse than a show horse. I spent a nice evening in the cool air conditioning at the Red Lion, whose desk clerk let me park on the sidewalk near the front door. The bar in the hotel, Barleyhoppers, actually has a brewery and makes a good brown beer. Check it out if you’re in Lewiston, ID.